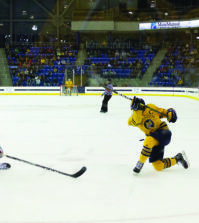 The Quinnipiac men’s ice hockey team defeated Robert Morris, 4-1, in a non-conference match-up at RMU Island Sports Center.Jeremy Langlois scored a goal and added an assist in the win for the Bobcats (6-2). The goal for Langlois was an empty net goal and team-leading eighth goal of the season. 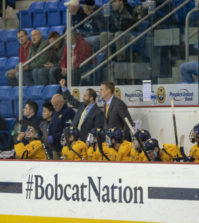 Matthew Peca scored the tie-breaking goal in the first period and Connor Jones and Yuri Bouharevich also added goals for the Bobcats.The Bobcats struck first at 6:34 of the first period when Connor Jones won an offensive zone faceoff and moved the puck back to Mike Glaicar who ripped a shot off the post behind Robert Morris goaltender Brooks Ostergard. Jones was able to follow the play and chip the puck into the goal after it hit the post. Robert Morris (2-3) tied the game, 1-1, on a 5-on-3 power-play advantage. Adam Brace scored off a rebound of a shot that was initially saved by Dan Clarke. Still down a man, Peca put the Bobcats back up, 2-1, just 27 seconds later. Langlois fed Peca, who snuck in the back door to one-time a shot passed Ostergard. The assist by Langlois gives him an eight game point streak to open the season, the longest since Eric Lampe in 2009-10. 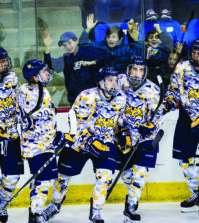 Langlois and Bouharevich added empty net goals for the Bobcats in the final minute of play, as they held off a late Robert Morris attack to win the game, 4-1. Clarke improved to 4-1-0 on the season, stopping 18 of 19 shots on goal and held Robert Morris scoreless in the second and third periods to secure the win. The Bobcats return to action as they open up ECAC Hockey play Tuesday, Nov.1 when they travel to Princeton to play the Tigers at 7 p.m.